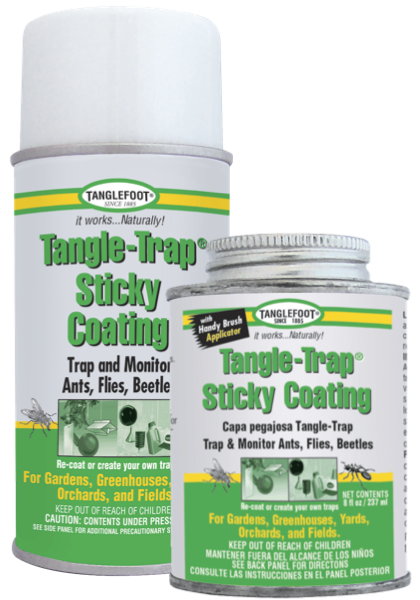 Tanglefoot® Tangle-Trap® Sticky Coatings traps and monitors tree pests and provides tree protection without the use of pesticides. Want to know what's invading your garden before it's too late? Now you can trap and monitor pests without the use of harmful pesticides with Tangle-Trap®. 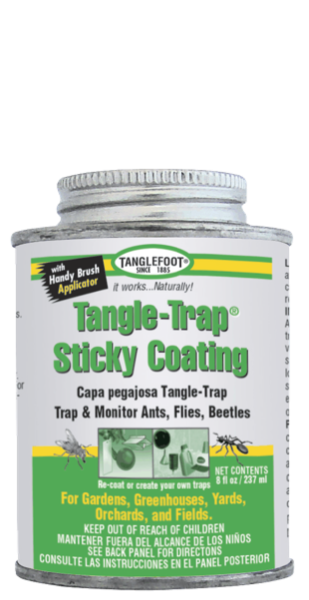 Tangle-Trap Coatings are ready to use and will remain sticky until covered with insects or foreign matter. Use Tangle-Trap® to re-coat existing traps or create custom traps and protect your garden. Place trap in desired location, attached to stakes or suspended, to avoid accidental contact with children and pets. Observation and experimentation are recommended to achieve maximum results. Traps can be made with waxed cardboard, glass, wood, plastic cups, plastic sheets or trap boards, empty milk cartons, red apple spheres or other surfaces. For ease of applications, use at temperatures above 60 degrees F (16C). Attractants can be used with traps to lure insects. Brushable Tangle-Trap is easily applied with a paintbrush. It is ideally suited for contoured trap surfaces. Aerosol Tangle-Trap is suited for any trap surface, but is not recommended where a large number of traps are required since it is packaged in the smallest quantity per unit. Clean tools with mineral spirits, waterless cleaner or baby oil. Do not reuse empty container.